The Rotary Club of Prince Albert was honoured to have Nicole Rancourt speak to us at our most recent luncheon. Ms. Rancourt is the current MLA for the riding of Prince Albert Northcote. She is also an avid Rider fan and supporter of sports and the arts. Before entering politics Ms. Rancourt was a registered Social Worker and worked in the Prince Albert Parkland Health Region. You can learn more about Nicole Rancourt by visiting http://www.ndpcaucus.sk.ca/nicole_rancourt. 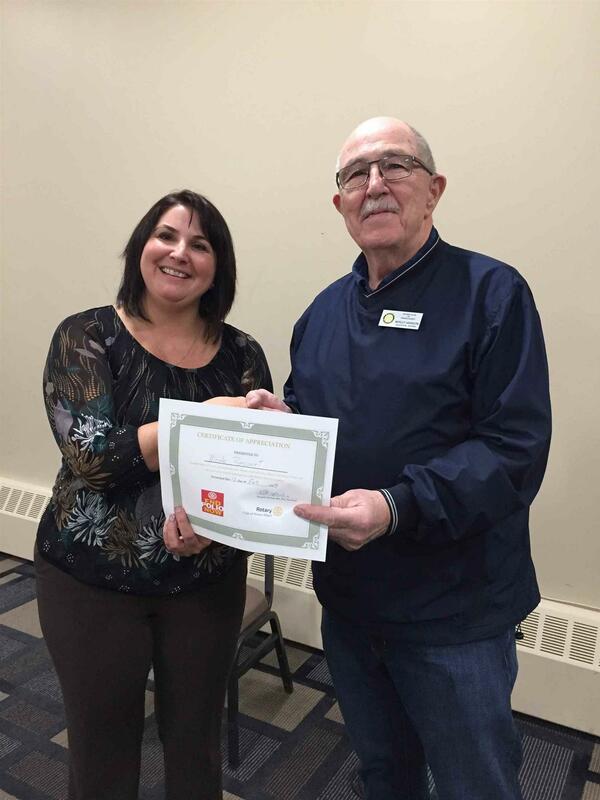 Rotary member Morley Harrison presents guest speaker Nicole Rancourt with a Certificate of Appreciation and a donation of $20 in her honour to the Polio Plus foundation.